This product is an older version of our study, Dynamic Christian Living. Content may not match current edition. Unfortunately, we cannot accept returns for these items. Quantities are limited. New Edition Available: This product, available while supplies last, is intended for the 3rd Edition (2010). It does not correspond to material in the new 4th Edition. Learn more about the new edition here. This product is an older version of our study, Dynamic Christian Living. Content may not match current edition. Unfortunately, we cannot accept returns for these items. Quantities limited. 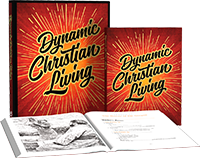 This product is an older version of our study, Dynamic Christian Living. Content may not match current edition. All sales of digital files and licenses are final. This electronic edition of the Teacher’s Manual ships as a PDF file stored on a CD-ROM. You can copy, print, and store the file as needed for personal use. Using free Adobe Reader software, you can view the file on PC, Mac, iPad, and PDF-friendly devices. New Edition Available: These resources, available while supplies last, are intended for the 3rd Edition (2010). They do not correspond to material in the new 4th Edition. Learn more about the new edition here.